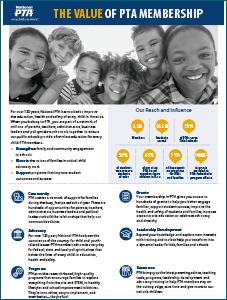 At convention in June 2018, National PTA’s officers reported on the strong state of the association and announced the need to invest our resources for long-term success in forwarding our mission to better the education, health and safety of every child in America for generations to come. While membership unfortunately continues to decline, our robust and ongoing resource development efforts have shored up some of our financial gaps. However, these stopgaps are short term. Today, $2.25 of each PTA member’s dues go to National PTA. Over 70% of that amount goes to programs and services. With inflation, the purchasing power of $2.25 is now only worth $2. 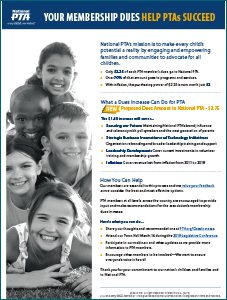 Get a comprehensive look at how National PTA supports your school. We need more to secure our brand and adequately support our leaders, schools and families, and invest in a bright future. Read the detailed breakdown of how the dues increase will be used to contribute to your success. Join National PTA President Jim Accomando and Officers Leslie Boggs, Anna King, Denise Sultz and Marques Ivey on this recorded meeting for State PTA Leaders. State PTA Leaders can reference these frequently asked questions to assist local PTAs and help share information about the proposed dues increase. Our members are essential to this process and we value your feedback as we consider the best and most effective options. PTA members at all levels across the country are encouraged to provide input and make recommendations for the association’s membership dues increase. Share your thoughts and recommendations for the proposed membership dues increase in the form below. Participate in our webinars and other updates as we share more information with PTA members. Encourage other members to be involved—We want to ensure everyone’s voice is heard! Thank you for your commitment to our nation’s children and families and to National PTA. Use these items for guidance at both state and local PTAs. These resources were developed over many months by a hard-working team of governance volunteers and National PTA staff, designed to answer the most commonly anticipated questions and to provide you with turn-key tools. How would your PTA benefit from a dues increase? Please share any thoughts, questions and recommendations on a membership dues increase and/or the process.